Heat-illness is entirely preventable with proper hydration and shaded rest. In many sectors, these safe workplace norms are not guaranteed, and recently it led to the deaths of two more laborers in California. Maximo Lopez Barajas was working in a pomegranate field and Cory Thomas was working in construction when they died. Heat-illness deaths have decreased because of CAL/OSHA outreach, education, and enforcement, yet, these two deaths demonstrate the efforts are not reaching all workplaces. Immigrants often find themselves in these lower-regulation work environments, creating dangerous work conditions. 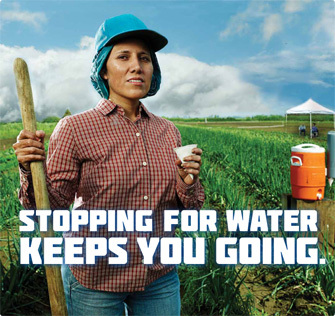 Farmworker advocacy group UFW is currently promoting legislation that would protect workers from heat-illness by improving stronger enforcement provisions. Secure Communities is the notorious program that has lead to the deportations of many immigrants. The program shares fingerprint of arrestees with ICE and was initially billed as a voluntary program to deport the dangerous criminals. After the roll-out of the program, it has been sweeping up immigrants into deportation proceedings and striking fear into many immigrant communities. The California TRUST act would limit California’s participation. Senate subcommittee voted the TRUST Act out of committee on a 5-2 vote Tuesday. It now goes to the Senate appropriations committee. Citing examples of dashed hopes for immigration reform, the NY Times published an editorial chastising the Obama administration for its inaction. The opinion piece was a follow-up from another NY Times article citing the failure of DHS Secretary Morton’s administrative review of over 400,000 deportation cases. The review has only closed 2% of cases, attributing the low clearance to time consuming background checks. Recognizing the impetus of many anti-immigrant laws, Village Voice Media, a conglomerate of regional publications, sheds light on the laws constructed to dehumanize Mexican immigrants in Arizona. They also profile Voter ID laws that limit voting for the poor and people of color. Both sets of laws seek to limit votes for people of color, and to further bloat white upper class suffrage. A recent nationwide telephone poll by CNN found that 75% of poll respondents favor SB1070. Another poll found that 73% of respondents do not think our current immigration system is working. To bring a global perspective, Mr. Zakaria chose to review immigration policies from Japan, Canada and Europe, hoping to find new insights. In Japan, he finds a restrictionist policy highlighted by a 2% foreign-born population and labor shortage. In Europe, he finds a more open approach to immigrants, that has also lead to xenophobic backlash. Finally, in Canada, he finds a country that welcomes immigrants for economic reasons. Per usual, CNN sidesteps root causes for migration and the health impact each of these policies have on immigrant communities. Alabama’s atrocious law continues to perpetuate racism, fear and inequities from all sides. A recent article in the Guardian shows that the law is threatening some of the most basic necessities, like access to water. A shameful poster in a town hall said “Attention to all water customers. To be compliant with new laws concerning immigration you must have an Alabama driver’s licence… or you may lose water service.” While the federal government has asked the appeals court to block Alabama’s harsh and discriminatory law, Alabama has countered by urging the court to let them continue with the atrocious law. California DREAM Act. Governor Jerry Brown signs the second part of the California DREAM Act (the first part had already been passed). While the new bills do not allow a pathway for citizenship, they do allow undocumented students to access state and private financial aid streams for college. Checkpoint Impounds. Brown also signs AB 353, which prohibits police at checkpoints from seizing a car solely because the driver is unlicensed. The driver’s car is impounded for 30 days and can result up to $2,000 in fines and fees, generating a lucrative industry for tow companies and local governments. Although the purpose of checkpoints is to stop intoxicated drivers, an investigative report found that, on average, six cars are impounded for everyone one drunk driver that is stopped. The law will take effect on January 1, 2012. It will give unlicensed drivers time to find someone with a license to retrieve the car and avoid impound. E-verify. 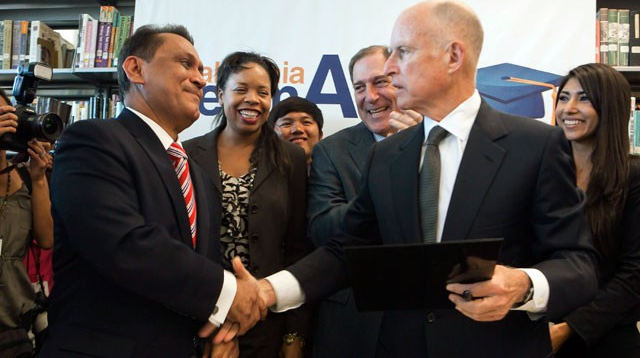 Brown also signed AB 1236, a bill the prohibits cities from requiring businesses to use E-verify. To get more updates on other legislative bills affecting our immigrant communities, check out the California Immigrant Policy Center. Given all the atrocities that we have seen against immigrants with laws in Alabama, Georgia, and Arizona infringing on basic human rights, I am proud of California for acting for the health and well-being of our communities. It is difficult for me to understand how some governments, like Alabama’s, are endorsing and seeking to enforce laws that infringe on basic human rights. These state governments are choosing to ignore the law’s wide spread negative effects on everyone: families, communities, employers, schools, and societies. This doesn’t even include the poor reputation that Alabama is now going to have with other states and nations. California’s Governor Jerry Brown should be applauded for his actions to improve the well-being of our immigrants. These actions are not only the fair and just thing to do, but they will also strengthen communities in California. While there is still more to be done, both on a local level and at a national level to provide a pathway of citizenship for our undocumented individuals, it is uplifting to see steps in a just direction. Let’s continue to push the movement of equality for all forward. The harsh and unjust effects of Alabama’s law are seen almost immediately. People are leaving behind their homes, parents are taking their children out of schools, and workers are leaving their jobs. Facing a labor shortage as a result of anti-immigration law, Georgia’s agricultural industry reports losses in millions of dollars ($140 million). Piggybacking on National Coming Out Day, LGBTQ organizations come out and urge President Obama to immediately eliminate S-Comm. The press release includes a call to other organizations to also endorse this action.